We’ll start with Weber State, which pulled off a huge upset of then-No. 3 Eastern Washington and had the biggest impact on this week’s rankings. Weber State won by a score of 14-6 and rose from No. 13 to No. 9 with the victory. Take a look up and down the FCS scoreboard this week, and you won’t see many games with so few points scored. But the Wildcats’ defense is legit. Eastern Washington had scored at least 55 points in two of its prior three games before going up against Weber State. The Wildcats were a different beast, and while their rise in the rankings was significant, they also helped some other schools who were lurking. #BigSkyFB Player of the Week! One of those teams is South Dakota State, which is up to No. 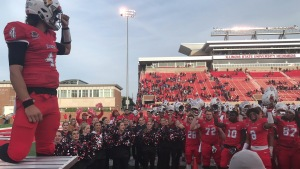 3 after pummeling Youngstown State 36-7. The Jackrabbits’ lone loss was to No. 1 North Dakota State, and it came by four points. Other than that, they’ve been spotless. While the Bison clearly deserve to be the top team in the country, the talent gap isn’t massive. If South Dakota State and North Dakota State meet again, it feels like it could go in either direction. North Dakota State has an intriguing test coming up in the form of No. 7 Illinois State this Saturday. The Redbirds rose five spots in the rankings this week after throttling Southern Illinois by 48 points. ISU has one of the top defenses in the land, allowing just 12 points per game this season. It will need to be on point against North Dakota State on Saturday. While the Redbirds would obviously love to win, a competitive loss shouldn’t drop them too far (if at all) if they can hang tight. Mark your calendars for that one. Furman also pulled off a massive upset this week, topping then-No. 4 Wofford 34-14. Wofford fell all the way to No. 12 as a result of the loss, which seems fair, given that it was by 20 points and Furman still isn’t ranked. The Terriers have a chance to redeem themselves on Saturday against No. 21 ETSU, but it feels like they let a prime opportunity to vault into the top three slip away. And finally, Delaware enters the fray at No. 25 after defeating then-No. 6 Elon over the weekend. Elon fell to No. 11 due to the loss, opening the door for schools like Jacksonville State (No. 4), James Madison (No. 5) and McNeese (No. 6). At this point, if you’re a top FCS team, style points don’t really matter. Just win, however necessary. Granted, North Dakota State and Kennesaw State were dominant in their wins, but they likely wouldn’t have fallen even had the wins been ugly. Other than NDSU, James Madison is the only top-five team that plays a ranked game this weekend (home against No. 17 Stony Brook), but as we just saw, these schools are still upset prone. It feels like anyone can go down at any given time. It was a crazy week of FCS football, and with three top 25 matchups looming, there’s likely more to come. Buckle up.